Why start slow, when you can jump right into things? For our first day of class, it was a whirlwind of activity. 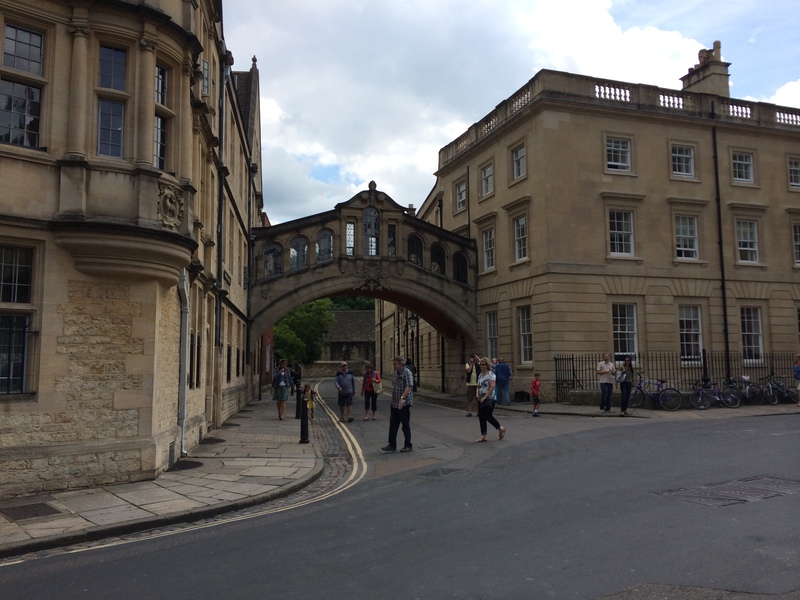 We set off in a coach to Oxford, saw the Bodleian Library and Christ’s Church, and toured the town. 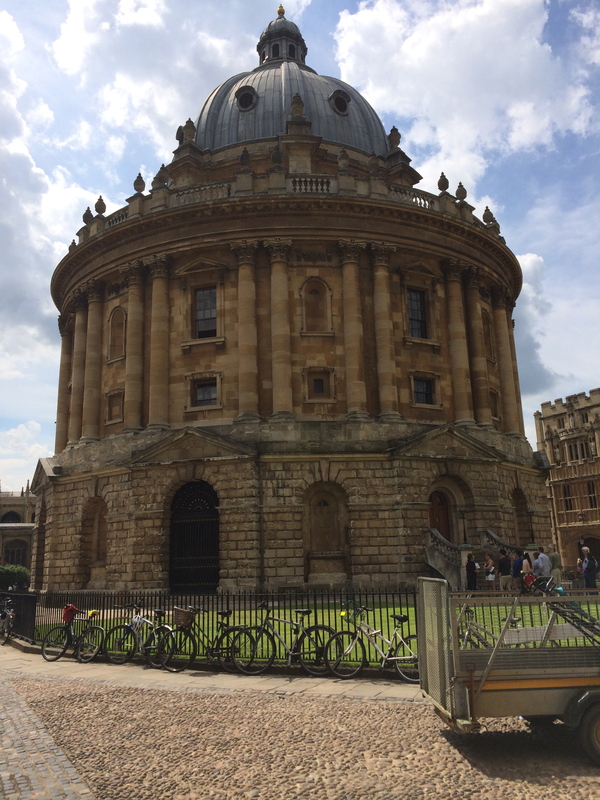 Seeing the Bodleian Library was phenomenal. It is an old library filled with equally old books. One of my graduate student jobs is in a special collections working with older books, from the late 1800s on. For me, seeing the books in Duke Humfrey’s Library was astonishing as most of the books are incredibly old, from the 1600s on. According to their website , there are even books from before 1641. Unfortunately, we couldn’t take pictures during this part of the tour. But, suffice it to say, the books were very impressive. I am interested in basically all of the possible paths that librarians can take. Since I already work in a special collections right now, I found this tour especially captivating. The amount of history that goes along with that building is slightly mind boggling. 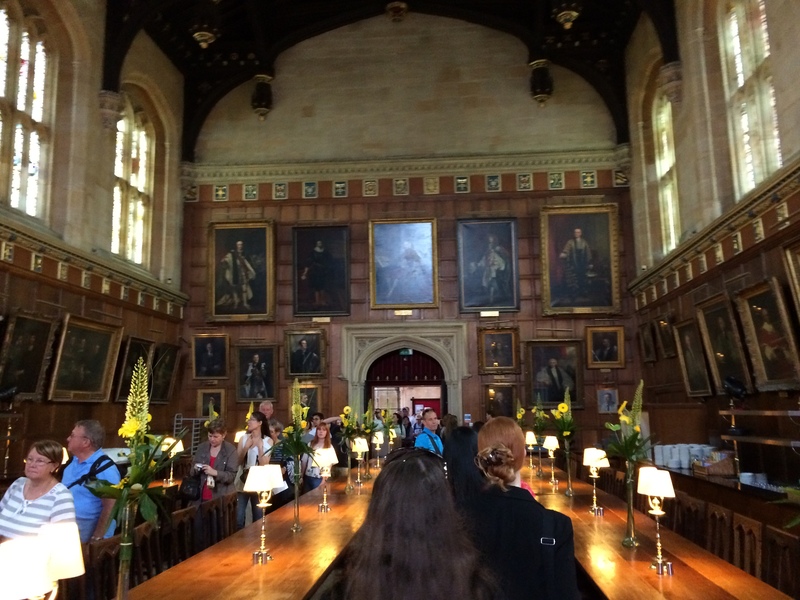 Our tour guide said that there is over 600 years of history in that building. 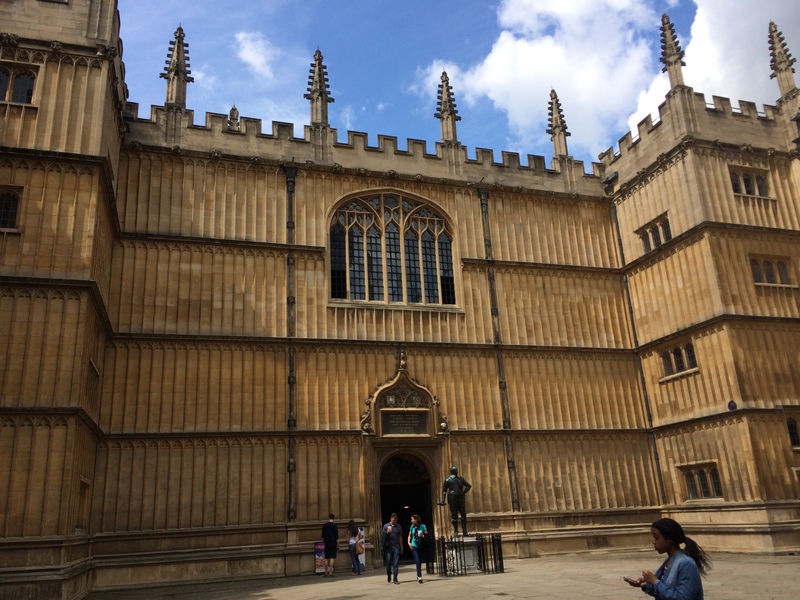 The original library was built in the 1400s, but the library was renovated in the 1600s by Thomas Bodley. Bodley kept some key things the same for his renovations; mainly the medieval setup of the library. He kept the bookcases at a right angle, away from the walls to protect them from leaks. This organically creates study stalls for the library users. He also stacked the books upright and not on their sides. This was a new concept and was the first time that it was done in England. Seeing all of the ancient advances in preservation was very interesting. Today, the advances are more along the lines of keeping the temperature and humidity at safe levels. There were many quirky, little things like this that we discovered on our tour of the library. For instance, their cataloging was different from what I would have expected. Instead of Dewey or Library of Congress (which obviously didn’t exist then), they created one. It had four categories, two of which are Bachelor of Arts and medicine. They also chained their books, so they couldn’t be stolen. However, the side they chose to chain their books left them no choice but to put the spine facing the shelf, which meant no one knew what the title was. In addition to these fun facts, there were loads of amazing sights. Afterwards, we broke for lunch, and then continued on to Christ’s Church. It was another sight that could have easily taken a few days to examine the entire place. Since we have such a limited amount of time at each place, it has made me a pro at quickly touring the sights I want to see. We toured most of the building and saw quite a few things. One of the standouts was this random staircase, which doesn’t look like much. However! 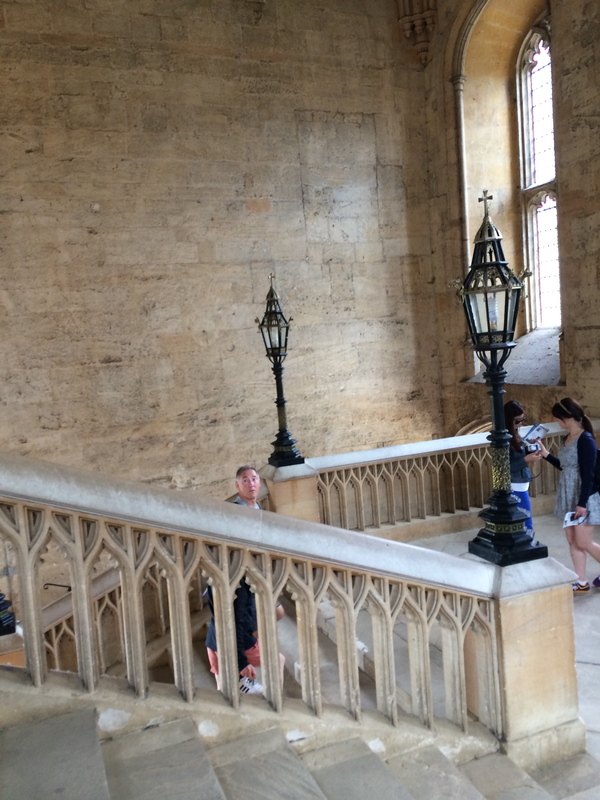 This may be the staircase that the Harry Potter movies based their staircase on. Possibly the source material for the Great Hall of HP? After that, we had a bit of time to explore the city itself. At one of our professors’ suggestion, we checked out a very touristy, but very fun shop. 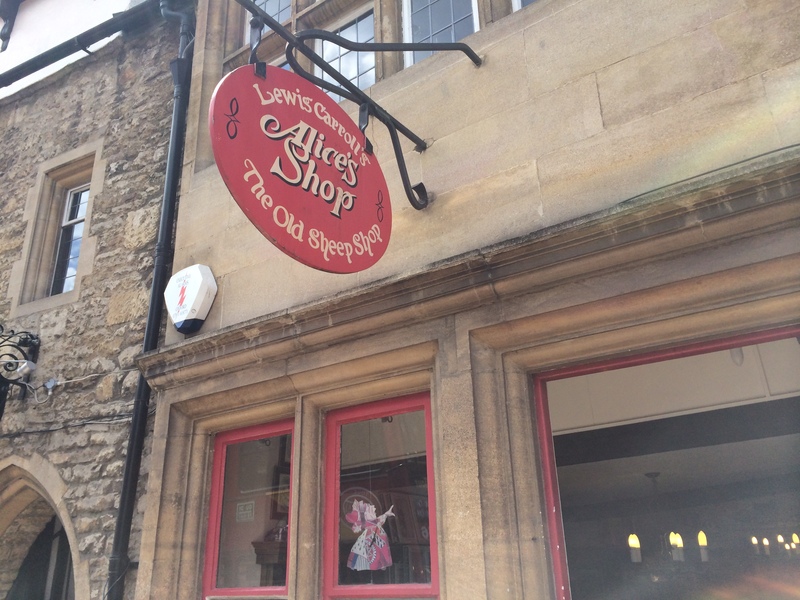 The Alice Shop was jam-packed with people, but it had a lot of cool little trinkets for my friends back home. All in all, it was a busy, but incredibly enlightening day. I have a sneaking feeling that the rest of the trip will fall somewhere along these fantastically fun lines.